Born on this date: May Irwin in 1862; Forrester Harvey in 1884; Moroni Olsen in 1889; Alberta Vaughan in 1904; and John McIntire in 1907. Classic Movie Daily subscribers will find images of May Irwin, Moroni Olsen, and Alberta Vaughan inside today's issue. Plus a few extra photos featuring one star from each of the recommended films that follow. —12:00 pm - The Man in the Iron Mask (1939). Underrated swashbuckler despite direction by James Whale, who calls to mind Universal horror of days gone by once that mask comes into view! Louis Hayward fine in dual leading role. Joan Bennett underused. Fun group of Musketeers led by Warren William with Alan Hale, Bert Roach, and Miles Mander at his side. Joseph Schildkraut effective villain. Pleased to see Doris Kenyon in small part as mother of the twins. —10:00 pm - The Moon and Sixpence (1942). Middle title in a triple-feature of movies directed by Albert Lewin (preceded by The Picture of Dorian Gray at 8 pm, followed by Pandora and the Flying Dutchman at 11:45). Based on the novel by W. Somerset Maugham, who I used to read a lot at one time. One of the greatest commercial literary authors. Story is loosely based on life of Paul Gauguin with Maugham inserting a character based on himself (Herbert Marshall again, as in The Razor's Edge) to guide the action. George Sanders perfect casting in a completely insensitive, yet extremely charismatic, role. Effective adaptation of one of Maugham's best. The pacing crawls in spots, but not as consistently as it does in Lewin's Dorian Gray. —Sunday, 6:00 am - Dodsworth (1936). I rank Walter Huston among the greatest actors of the 20th Century, and this film is a large part of why. My review is HERE, but realize I've become a much greater fan of Ruth Chatterton's portrayal since I wrote that piece. —Classic Movie Daily on vacation June 29-July 5. If Viola Dana taught me anything yesterday, it's that I've got to get my head in the game to finish first draft of my Helen Twelvetrees biography. Luckily, the lesson fell right around the time a lot of people take off anyway, so I'm going to join the crowd. Mine will be a working vacation with an end goal of completed first draft by July 6. I'll be a bit ahead of things since half of the book (the "Films of" section) is already in final draft. When I went to a daily post format back at the beginning of April, I had gotten stuck on my Twelvetrees research. I had too many loose to begin drafting the biographical part at that time. That's no longer a problem, and the daily routine of putting this newsletter together had a lot to do with that. Right now the "Daily" is a bit of a distraction, but I have enjoyed this blogging format much more than I had expected, so it will resume on July 6. I'll give you a Twelvetrees progress report at that time. —First things first though. I owe you a review of The Good Fairy. It will either be in tomorrow's edition of the Daily, or I'll post it sometime during that week I'm supposed to be off. Call it a soft vacation: if I get a notion to post something, I'm going to post it. But if everything breaks right, I expect seven solid days of writing away from the blog. —I forgot a note I wanted to include yesterday, on the 125th anniversary of the birth of Jeanne Eagels. My copy of the new Eagels biography did arrive this week and, while there will be a full review later, I can already say—just three chapters in—you'll want to buy this. Very well-written, very well-researched. I'll save the rest for later, but something will have gone dreadfully wrong if the end result isn't my highest recommendation. —Last week I put my entire eBay Store on sale. This week I'm being a bit more selective, but the discounts are steeper. I'm doing my best to blow out older stock with discounts currently ranging from 35 to a whopping 60% off. THIS LINK takes you to sales listings only in my eBay Store. 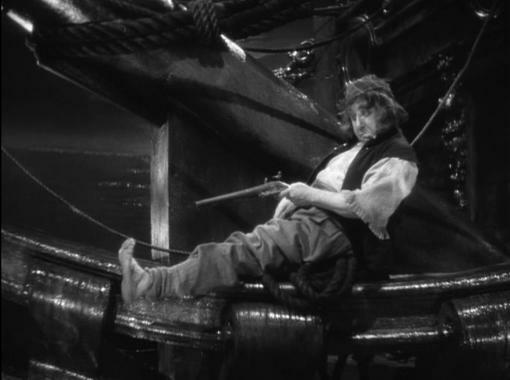 Above: Forrester Harvey as Honesty Nuttall in Captain Blood (1935).